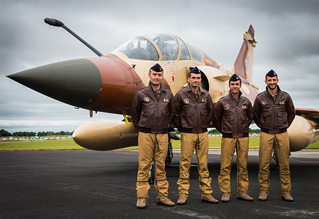 Last year's retirement of the Armée de l'Air's hugely popular RAMEX Delta display team was widely viewed as a huge loss for Europe's airshow scene; mounted on the Mirage 2000N, generally considered among the most charismatic jets in the world, the team were held up as one of the most dynamic and punchy displays on the circuit. Given the perhaps surprising rarity of the Deux Mille on UK shores, British enthusiasts weren't sure when the next opportunity to see one of Dassault's finest would be. 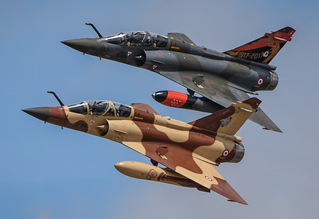 However, rumours persisted of a new team working up and, indeed, in February it was announced that a pairs display of Mirage 2000Ds had been formed; the name of this new team was Couteau Delta and since their first appearance they've taken the airshow world by storm. Making their UK debut at the world's largest military airshow, the Royal International Air Tattoo, the team have had the grandest of stages on which to prove themselves. 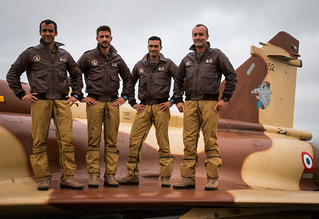 Sam Wise sat down and chatted with Capitaines Elvis, Pastif, Axel and San about their first year and the experience of going to RIAT in an exclusive interview for UK Airshow Review. Photography by the UKAR Staff team. The Mirage 2000 family has provided the backbone of the Armée de l'Air's frontline fighter fleet since the 1980s, the single seat C variant being the first to enter service. Where RAMEX Delta, drawn from Escadron de Chasse 2/4 "La Fayette", operated the nuclear capable two-seater 2000N version, Couteau fly the ground-attack and strike variant of the type, the D model. In fact, surprisingly it was the N variant which came first with the D model a later development from it, flying five years after its forebear in 1991. There are few differences between the two variants, the 2000D simply being an N version with support for air-to-surface missiles and various other strike capabilities not required for a dedicated nuclear platform. Externally they are identical apart from one tiny difference - the 2000N has a pitot tube on the tip of the nose whereas the 2000D does not. Good luck spotting that from the ground! The team is formed of two Escadrons de Chasse from Nancy-Ochey air base: 2/3 "Champagne" and 3/3 "Ardennes", though two of the aircraft they have used are actually from EC 1/3 "Navarre" (and are painted in special schemes commemorating the centenaries of two of that squadron's flights (escadrilles), SPAs 95 and 153). While the Rafale "omnirole" jet is slowly taking over in service from many older types in the French military, the 2000D still remains relevant, having been part of the French Air Force's efforts over Syria and Iraq as part of Operation Chammal since 2014; notably, it has fired the Storm Shadow cruise missile (known as SCALP-EG in French service) in combat. It is expected to serve for at least another 15 years following a Mid-Life Upgrade. Given the regretful retirement of RAMEX Delta last summer it was quite surprising for the British enthusiast to see a new Mirage 2000 display team return only the following year, but for the crews it was perhaps less of a surprise - the current Chief of the French Air Force originates from their wing where he was a commander of an Escadron de Chasse and flew on the Mirage 2000D. In fact, the initial discussions were to see a Rafale C pairs display take over from the 2000N; however, with the type still heavily involved in operations it would have placed too great a strain on the fleet to have taken crews and airframes away for a display team. 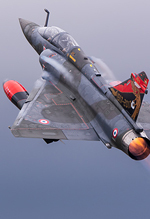 Fortunately, the 2000D fleet has considerably fewer responsibilities for the foreseeable future and with a veteran of the type at the top of the air force, it was perhaps inevitable that this Mirage variant would be called up to the airshow scene. Though the team's formation was officially announced in February, the decision was taken in January to form a team at Nancy-Ochey airbase. For the first year's tactical display team, it was decided that the crews must have, among other qualifications, experience as a four-ship lead. From those available for selection, the squadron chiefs chose their crews, and the Third Fighter Wing commander decided which crew would be the team's lead: Delta 1 sees Elvis (pilot) and Pastif (WSO) as crew, Delta 2 sees San and Axel respectively. If the team's mounts might appear identical to the showgoer on the ground, said viewer could be forgiven for thinking it really was RAMEX reborn in the sky as for their first year the team have opted to run the same display routine as RAMEX Delta's of the last couple of years. This certainly won't draw any criticism - it is, after all, a trophy-winning display! The reasoning is quite straight forward: with only five months from official confirmation of their new roles to the first scheduled display, there wasn't enough time for the crews to safely work up a new routine along with all the other required roles alongside the flying. None of the members have previous display experience, so the process of making a debut demonstration was daunting, but they have had help from some familiar faces, as Axel explains: "We found the process OK with the help of the RAMEX team from before, so despite it being new for us we've had great help from the previous Delta guys. It's a big task for the four guys in the team, so while at the moment it's quite difficult we've been able to try our best with the help of the previous team. We've kept in touch and, in fact, part of the team from last year are here at Fairford with us to return the trophy they won - Camille and Pierrot, the ‘wingies'." "We'll try to be as good as them but the level is very high! 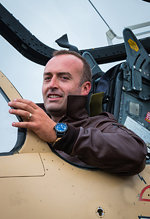 We know people were quite in love with the RAMEX Delta display and that they'll be looking at us hoping to see the same level of skill even though we don't have the same amount of training in display flying that they had." It was taken as a great compliment when someone on the ground described the display as just as good as RAMEX were last year - it is clear that this has been their goal for their first season and to be flying such a powerful display so well at just their third airshow is a supreme achievement. There's a fair bit more to display flying than simply getting in the jets and performing a routine, and in fact the crews were surprised at the added extra work. Pastif, who runs the team's social media accounts, detailed some of the tasks they have taken on: "It's a lot of work, and it's not just the flying. We also have the work for the social networks, for media events and publicity, for the merchandising and goodies - a lot of things that we've never had to do in our day jobs so it was a huge amount to suddenly take on overnight." They delegate the tasks between themselves and their support, with Axel doing the photography work for example. Though they've gladly accepted the mentorship and built upon the foundations of their spiritual forerunners, there's no doubt that Couteau are out to make a big name for themselves and are keen to build their own brand. "We've chosen to fly the same display as RAMEX to ease our beginning, and where people saw the 2000N before and now the 2000D which is very similar they might not even know that the team has changed at all, so we're keen to make a split from the their identity and form our own appearance and our own spirit as a team." Anyone who saw them in the showground at Fairford will appreciate the efforts to which they've gone in pursuit of creating the Couteau brand. A plethora of branded merchandise all featuring the team's new, unique logo, matching leather patches for their flight jackets, a pretty hefty publicity tent adorned with shots of the team, banners, flags and everything else that marks "We are here". The flightcrews were out every day too, meeting the public, chatting with kids, handing out freebies and showing off their presence, while the groundcrews manning the stall went all-in with tricolour berets and facepaint. It's all pretty large scale, professional stuff for a team just into its first year of existence, and it's great to see how much stock the French Air Force has clearly placed in them so early on by providing resources and materials to support advertisement. It's not just the showground on which the team has made a big splash though. Increasingly a huge part of any publicity effort has been on social media, a field in which the RAF has been pretty hot on over the last couple of years - every display asset has had one or two accounts associated with it across the various networks. Couteau have been no different, with Facebook, Twitter, Youtube and even Instagram accounts appearing right from the get-go, regular updates and photos and a great deal of interaction with the followers who get involved - an aspect occasionally, but not often, missed by those running other team accounts. It's been a big part of the team's drive to create that unique identity, that difference that marks them out from previous teams. "We've tried to be very modern in creating our new brand," explained San, "We've felt through it that people have been very enthusiastic about us. We've not really been able to let people follow our progress as such as it's not been possible to share quite everything with them, but we've been able to show people the different steps of the display routine, the different crews of the team, the transition with RAMEX and people have been very receptive. We plan to continue with the social media work if we want to carry on creating this positive feeling about the team." In the British military it's not uncommon for serving flightcrew and others, not just those on display teams, to have personal accounts that discuss their lives and day jobs - not in the finest of details, of course, and not recklessly, but in a way that opens their jobs up to people. In the famously security-heavy French military, however, this isn't the case: "Sharing our experiences online has been a good thing for us, because in our day jobs it's forbidden for us to post our photos, our experiences, our lives as fighter jet crews, so it's a great side of our new jobs to be able to share with people what it is we actually do every day. It's a good thing for us and we hope it's a good thing for everybody else too." That said, you won't be surprised to learn that Elvis, Pastif, San and Axel are not their real names! You only have to check out their pages to see how much they're enjoying themselves; there's a good deal of banter at every show they attend, plenty of updates about how they're getting on and more than a few tasty Mirage 2000 pictures. And the good news for us on the other side of the channel is that they post bilingually (some of the time! ), clearly aware of the international stage they now find themselves on. 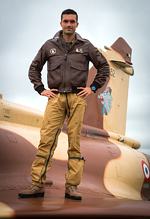 Of course, this effort isn't just about sharing selfies for the team, it has a huge benefit for the Armée de l'Air as well - as with any display team, a significant purpose of the job is boosting recruitment for the air arm. There's no doubt that the team are aware of this. According to Pastif, who runs the accounts: "The aim of sharing our flying experiences and moments is to show that this kind of job is accessible to the maximum number of people. We want to show that there are a lot of jobs in the air force, that if you want to join the air force, you can: you can be a pilot, or a Weapons Systems Officer, or whatever you want to be - you don't need the highest qualifications, a normal degree is enough to try for these roles. We make no secret of the fact that it's difficult, but we want people to know that the roles aren't as unreachable as they might think - if you try for it, you might just get it." Perhaps less important a function when performing in the UK, but for the various French audiences that the team will be performing in front of this year it will no doubt be a powerful tool indeed. Where the previous Delta team took a full six years to reach the Air Tattoo after forming, it only took Couteau three air shows to make the same journey. The significance that RIAT holds in Europe can't be understated, even for poignant events - when asked, last year, how it felt that the famous RAMEX Delta team were putting on their final performance at a show in England and not France, a French Alpha Jet crewman commented that it was far better to see them off at the biggest show on the continent than at a small, minor show in France. Accordingly, it was an honour to have Couteau Delta performing on the Friday show this year - it was the 14th of July, better known as Bastille Day, the largest national day on the French calendar and a huge event for the air force who stage a grand flypast down the Champs-Élysées every year on that date. Furthermore, it was only the third show that the team had performed at this year (the first two being French airbase open days at Saint. Dizier-Robinson and their home of Nancy-Ochey), marking quite the step up in scale. 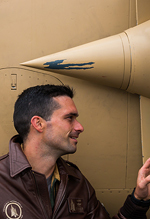 The size really, was what got to the team - they all mentioned how big the show was, the sheer number of aircraft compared with their previous displays, and of course the variety of teams and aircraft from all over the world. Singled out was the opportunity to meet the other display teams, "We're young in the airshow world, we're new to this. Before RIAT we didn't have any real contact with the other patrols and displays so it's been great fun meeting them and speaking with them. It's only our third airshow! It's been just amazing to be here, so many aircraft, so many people, it's like nothing we've seen before. Not to mention seeing some of the most modern aircraft like the F-22. So for us, to be here is like a young boy's dream." Catching up with them after the show was over, the team had these words to describe the experience of attending the Royal International Air Tattoo: "It was an awesome experience! We saw the best displays in the world and many wonderful aircraft, both on the ground and in the air, not to mention some really nice people. Is there any other place where you can see a Typhoon solo display, then a warbird flight with mythical aircraft like fighters and bombers of WWII - then a Su-27 performance, a B-2, the Red Arrows, Chinook, Thunderbirds? It is probably the best place to be for aviation lovers. We performed our display four times (one rehearsal and three "live"), the weather was not so bad and even if the display needed to be adapted due to the weather we had good time! We didn't have any problems with the aircraft, and the organisation of the airshow was very good. This airshow was our first outside of France, which gives us more experience and shows the potential limits of a deployment out of France for all our staff: mechanics, safety officer, commentator etc. It was a fantastic trip for us, we hope that the public had the same enjoyment watching us as we had flying for them, and we hope to be present next year with many rewards…"
The four crewmembers will be back on the team next year, and they've every intention of improving on their first season. A new display routine is in order, to really separate them from RAMEX Delta, although given the premise of the team it might not change all that much. San explains why: "Our display is a tactical display. This means we don't perform anything like barrel rolls, aileron rolls - the range of our manoeuvres is quite restricted. For sure, we want to make our display routine evolve - we'll modify it, we'll adapt it, we'll make it distinctly ours, and next year we'll bring a totally new one but it'll maintain the display theme of a tactical role demo." To simulate combat operations configuration, the team, as with RAMEX, always display with the inboard pylon fuel tanks on which limits the jet to a maximum 6g load. 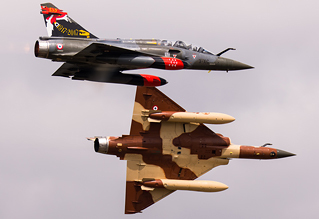 British enthusiasts have noted with joy that the French Air Force has produced a veritable feast of commemorative special schemed jets this year, and it was gratifying to see three brought to RIAT to be flown across the show weekend. Sadly, next year the team won't operate quite so many, though they do have another escadrille anniversary in 2018 so there should be one commemorative paintjob to look forward to. That's if they come to the UK, of course - there's no idea yet where they will be performing next year, although they know they will have "many dates". They hope to return to the UK and to RIAT, and in fact Jersey was specifically mentioned as well, presumably for the consistently better weather. Couteau Delta were always going to be popular in the UK by virtue of simply by flying Mirage 2000s. But their personality-laden announcements and coverage, their genuine enthusiasm for their team, their new jobs and the opportunities that they have been given to make a name for themselves is at once infectious and encouraging. When you speak to them, as hundreds have done on their daily patrols through the showground, you meet guys who are excited to be entering what is, for them, a new world and new community of aviation, honestly keen to engage with the people watching them from the ground. Their future is promising, especially with two or three more years for the current pair of crews, and they're full of potential for what will undoubtedly take its place as one of the continent's great and memorable display acts. UKAR would like to give thanks to the Couteau Delta team for taking time out from their airshow weekend to assist with creating this article as well as to the RIAT Media Team for offering their facilities and services during the Air Tattoo weekend.